APMEX is a leading source for those who need to buy silver or gold coins for their collections and investment portfolios. For more than a decade, APMEX coins, silver rounds, and silver and gold bars have been selling to customers throughout the United States and around the world. To date, APMEX has sold more than 2.4 million ounces of gold and nearly 100 million ounces of silver. 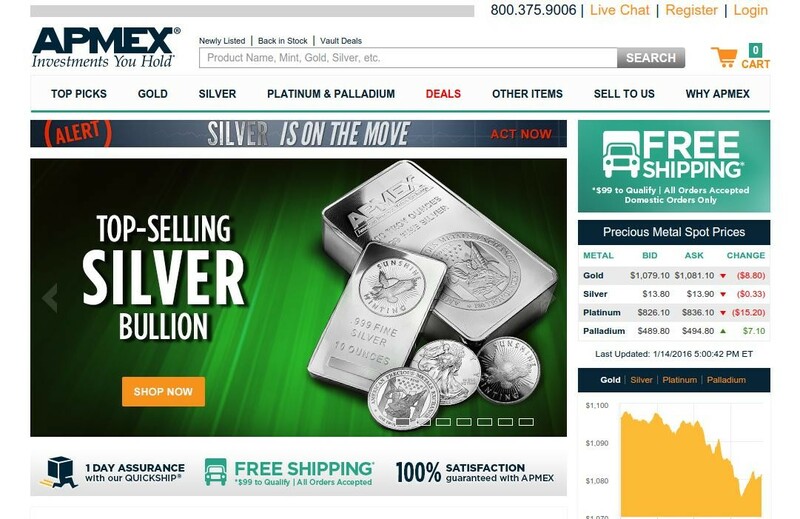 The bullion company conducts virtually all of their business on the Internet, and can often ship orders within a day. So you can rest assured that your gold and silver bullion orders will arrive in a prompt fashion. Their timely service and outstanding selection are just two reasons that the company has gained countless repeat customers. APMEX sells a wide variety of gold and silver products. Just some of these include: American Gold and Silver Eagles, Gold Buffaloes and collectible US Silver and Gold Coins. Their ample list of coins, rounds, bars, and other products barely scratches the surface of what APMEX offers for sale. What’s more, they sell these products in a wide array of quantities. Most are available in single quantities, but they are also available in bulk orders, too. APMEX, is really an ideal silver and gold bullion firm for buyers and investors with any budget. Many of their products are offered for under $20. To help make the purchase of silver and gold bullion even more affordable, APMEX sells many of their products at discounts when ordered in bulk. This can help you save big bucks on your purchase and lower the overall premium you pay for your bullion coins, bars, and rounds. If you would like to sell your silver and gold bullion, APMEX buys these products, too. You will find buy and sell prices for most of the products on APMEX on the company’s website. The site is updated on a constant basis, and the buy and sell prices usually reflect the current spot price of silver. Here at Coin Values, we also have an up-to-the-minute silver and gold price index, and this will help you determine how much you will pay for the gold and silver coins you want to buy from APMEX or from another coin dealer or bullion distributor. I've been purchasing the previous time from Apmex gold bars and I cam accross the problem. They do not allow direct bank withdrawl from accounts, which is not very comfortable especially to people who use that option all the time. Though the navigation is comfortable and the search is flexible, you can find whatever you need.